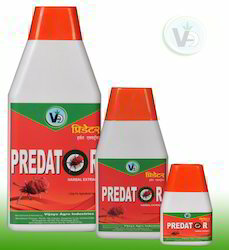 Prominent & Leading Manufacturer from Sangamner, we offer predator pesticide. We offer Predator Pesticide. Predator is Karanj (Pongamia pinnata) based product in EC formulation which is a broad spectrum Miticide Bactericide (Preventive Major) Acaricide. Predator is based on triter pens from Karanja. Active ingredients are observed to be Karanjin. Broad spectrum effect on most species of mites. Doesn't leave any residue on crops so safe for use and recommended for Organic agriculture and Integrated Pest Management.